Wow! Frenzy indeed. I wonder what happened when all the combs were cleaned up? Would it encourage robbing? It became very peaceful towards the evening. 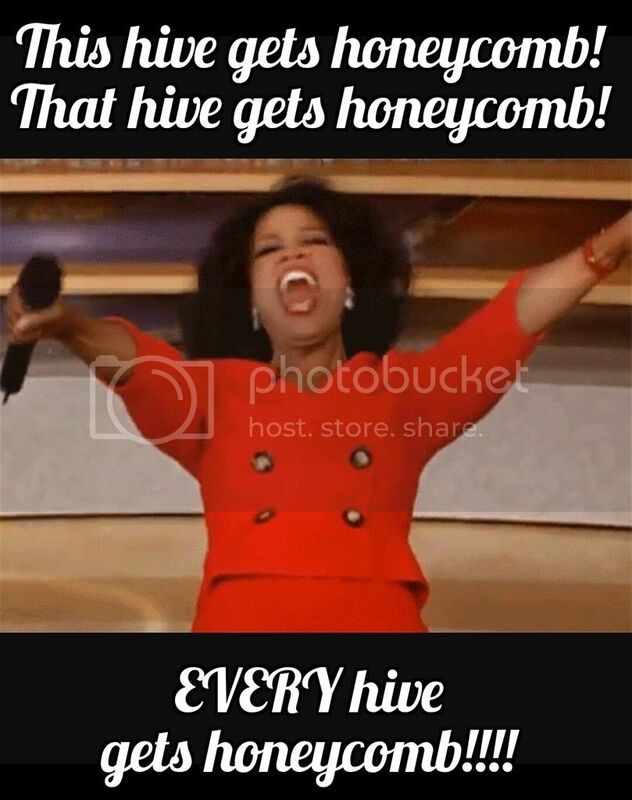 I cleaned up all the comb carcasses last evening after it happened and all is perfectly calm and clean here the next morning. That looks like a recipe for disaster to me. If you need to open feed (also known as station feeding) it would be better to set up a single location, away from any of the hives, and put the feed there for them all to help themselves. What you have done is to teach your bees that food is available at the exact locations of the other hives, which will lead to robbing, sure as night follows day. Phil, thanks for the input. However, I had no choice in cutting-out the bait hive in my back yard. I have to maintain inspectable hives. Also, hives that are not inspected become a small hive beetle factory. So even if I were to drip just one drop of honey in a remote corner of my small back yard, a huge robbing session would ensue from the neighborhood bees of all my hives. Admittedly, it was not an ideal situation, but by placing large chunks of comb on the outside of each hive, it would help disperse the robbing and keep the robbing to the outside of the hives. Plus, my hives would receive great benefit from it. I normally do not even feed bees - PERIOD. This was a very rare occasion. It could have been a disaster, but was not. I knew the risks, but it was an educated gamble. Besides, look at all the entertainment it has provided the Continent of Europe. So I had to do a partial cut-out/comb-correction of a bait hive that's had bees for approx one year that I just brought home to my back yard.